Asian shares slipped to three-week lows on Thursday as a surprise deterioration in German and South Korean economic data rekindled fears of slowing global growth, while oil prices pulled back slightly after a sharp run-up earlier in the week. MSCI's broadest index of Asia-Pacific shares outside Japan eased 0.5 percent, while Japan's Nikkei average closed up 0.5 percent. The Japanese yen traded slightly higher than then previous session's four-month lows and showed a muted response to a Bank of Japan policy pledge to keep interest rates very low at least until early 2020, even as it retained main policy targets. Microsoft shares rose 4.4% to $130.54 in late trading after the forecast issued on a conference call with investors, pushing the company ahead of Apple Inc's $980 billion market capitalization. Microsoft's stock has gained about 23% gain so far this year, after hitting a record high of $125.85 during regular trading hours. Azure, Microsoft's flagship cloud product, competes with market leader Amazon Web Services (AWS) to provide computing power to businesses. Net income was $8.8 billion, or $1.14 a share, compared with an average analyst estimate of $1 a share, according to data compiled by Bloomberg. 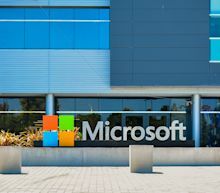 The fiscal third quarter featured a flurry of large brands, particularly in retail, signing agreements to use Microsoft’s Azure cloud software. Clients included grocer Kroger Co., Walgreens Boots Alliance Inc. and oil company Exxon Mobile Corp. Some, such as Walgreens, also committed to using cloud-based Office and security software. On a conference call after the report, PayPal said it was pleased with plans to make money from Venmo app, although it didn’t offer specifics. Shares of PayPal have risen 28 percent this year, as analysts expected the company would continue reaping benefits from a strong e-commerce market and hopes that Venmo will soon turn a profit. PayPal’s stock fell as much as 3.14 percent in extended trading on Wednesday before recovering to its $107 closing price.